Americans dodged a bullet, or a knife blade and four tires when a Somali “refugee,” as we have been instructed to call terrorists in waiting, decided he preferred the killing fields of Canada over those in the United States. He was already here but was being forced to live in the shadows. Canada was thought he was a perfect candidate and granted him refugee status. He didn’t have to bother with trying to get past the Trump travel ban, picking the right week when a rogue Obama judge had opened the Somali terrorist pipeline or when President Trump was able to temporarily close it, he came in during the Obama regime. He crossed the Mexican border like other “dreamers.” His dream just happened to be to kill infidels in the name of his “religion of peace” and ISIS. With Obama’s drive to Islamify America, there might be even more than 800,000 of that variety of his favored illegal dreamers. It was 2011 when Somali national Abdulahi Hasan Sharif entered the US through the San Ysidro port of entry in California. He had no documentation, but it wasn’t needed. He was held for a while at the Otay Mesa Detention Center in San Diego before being ordered deported and, with a couple of winks, released on an “order of supervision” in November of 2011. Naturally, that was the last the US government ever saw of him. Sharif then stole a truck and struck another four pedestrians. Canadian officers found an ISIS flag in his car and he has since been charged with multiple counts of attempted murder, criminal flight causing bodily harm and possession of a weapon. He’s one refugee that’s not going anywhere else. Two years ago, Canadian authorities investigated this same 30-year-old terrorist for espousing extremist views. Still, the only way to have prevented the incident from happening would have been to deport him on the spot and Canadians under Trudeau don’t do things like that. It’s not considered as being a good global citizen. Judicial Watch has been monitoring the situation for years, with a high ranking DHS official confirming to them last year and on other occasions that Mexican drug traffickers help Islamic terrorists enter the United States to evaluate and identify future targets. 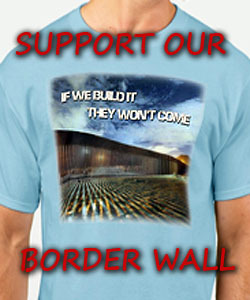 Judicial Watch notes that he once bragged in an Italian newspaper article that the border is so open that he “could get in with a handful of men, and kill thousands of people in Texas or in Arizona in the space of a few hours.” Ciudad Juárez shares a border with El Paso, Texas. with those BLACK ROBED PETTY TYRANTS BANNING TRUMPS TRAVEL BANS ON THESE SCUMBAGS. if i were Trump, i’d SEND IN THE US MARSHALS AND HAVE THEM ARRESTED FOR ACTING ON BAD BEHAVIOR AND CREATING SEDITION AND SUBVERSION OF A COMMANDER IN CHIEF. IT’S CALLED USURPATION AND I’D NOT STAND FOR IT. this CAN’T BE ALLOWED TO CONTINUE FOR ANY REASON. either Trump is the PRESIDENT AND COMMANDER IN CHIEF, OR THEY ARE IT CAN’T BE BOTH WAYS.